Japanese Episode AG 048: "Zanguusu VS Habuneeku! Raibaru Taiketsu!!" American Episode 320: "ZigZag Zangoose!" While camping out one day, Satoshi and his friends are approached by a Zangoose and its trainer. Much to their surprise, the trainer turns out to be the Short-Pantsed Boy, Kiyo! Kiyo tells our heroes about his failed attempt at getting the Balance Badge from Senri, and afterwards Satoshi asks Kiyo if he wants to battle. Kiyo agrees, so the two hold a pokemon battle. After Satoshi's Kimori KO's Kiyo's Numaclaw (who had evolved from his Mizugorou), Kiyo sends out his Zangoose. Meanwhile, the Rocket-Dan are watching the battle from afar, and Musashi releases her Habunake in preparation for kidnapping Pikachu. 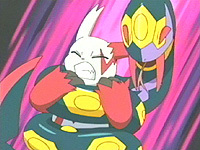 However, when the snake pokemon spots the mongoose pokemon, the two rivals start to ignore their trainers and fight! Habunake manages to inflict some damage on Kiyo's pokemon before it's sent drifting down a river, ending the battle for the time being. As Kiyo tends to his injured pokemon, Satoshi gives Kiyo some advice about battling Musashi's often-defeated pokemon. Habunake eventually finds Zangoose and resumes the battle they had started by the river, but Kiyo's pokemon is too weak to do anything but dodge. Kiyo quickly thinks of a strategy that involves having his Zangoose run around in a zigzag pattern to confuse Musashi's pokemon. The plan works, and Zangoose is able to gather enough strength to send the Rocket trio blasting off. Kiyo thanks Satoshi for all his advice and is confident that he will be able to win a rematch against the Touka City Gym Leader. You know how there are all these fans out there who believe that the Rocket-Dan is getting old and that the show would be a whole lot better if they left? Sometimes I think that would be true, but when they save an absolutely horrible episode like this one, I can't see the show being the same without them. I didn't care about Kiyo at all in this episode, and I didn't really care too much for the Habunake / Seviper rivalry. No, the part of this episode that kept me watching was the Rocket-Dan. Musashi getting angry over Yamato showed some nice continuity, and seeing Nyasu fill in for Musashi during the motto was a great moment as well. The dub is alright, except that they altered the pronunciation of Zangoose's name (in Japanese, the a is more like the a in father, while in the English dub it's pronounced more like the a in bait). In addition, 4Kids continues their tradition of dubbing over pokemon who have the same name as they do in the Japanese version for no reason at all. Unless there's some legal issue with the Japanese VA, I don't see why 4Kids couldn't have kept Zangoose's Japanese voice. The first two seconds of the episode are removed from the dub. After the first showdown between Habunake and Zangoose, there's a pan down shot of Kiyo at the campsite, looking over his injured pokemon. The dubbed version of that pan shot is two seconds shorter. And...well, my episode tape got cut off before the TO BE CONTINUED... screen, so I have no way of telling how much that shot was shortened by. I'm going to guess two seconds.